In one popular post on the game’s subreddit, one player said that the Stash limit is ruining the game for them. “I have a modest amount of a bit of everything and I am full,” they wrote. “This leaves no room at all to collect different guns and blunt weapons and sets of armour and power armour.” They said that while the limited space fits in with the idea of Fallout 76 as a survival game, it cuts against the endless loop of collecting, crafting, and upgrading that MMO-style games are predicated on. Another player even made a very handy guide for how to get the most out of your Stash, with tips like what order to break junk down in and a hierarchy of items worth holding on to. “Ammo is also fairly common, and can be specifically crafted for your weapon if you find that sweet sweet favourite weapon,” they wrote. “So don’t save 800 shotgun ammo. Just drop it, it cannot be sold.” However, even that player thought the storage limit should be, at least, quintupled. It remains to be seen how soon that particular change to the game will get implemented. Destiny’s inventory system had a similar problem when the game first came out back in 2014, and it wasn’t until the following April that Bungie finally expanded players’ vault space so they could hoard more of their rare loot. 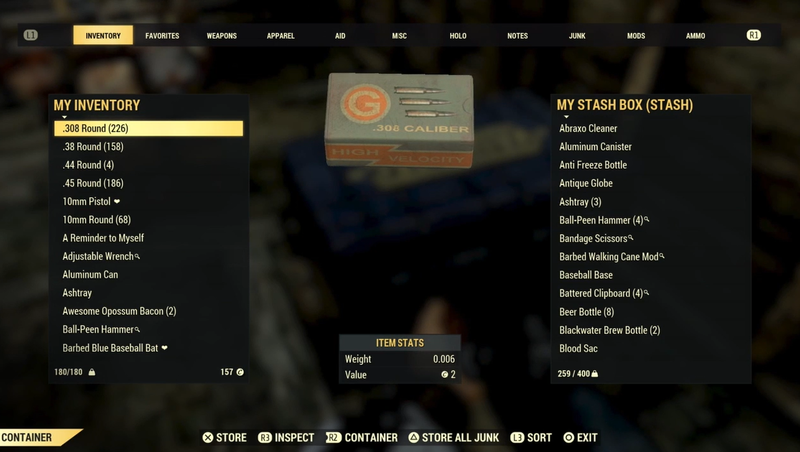 Hopefully Fallout 76’s Stash size gets fixed sooner than that.